On Tuesday we flew to Oslo and took the train to Lillehammer. 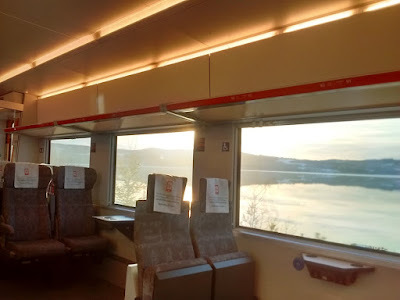 We had a couple of days to explore before the Birkebeiner and we thought staying in Lillehammer, the site of the finish of the Birkie, would be a fun way to relax. Lillehammer is the site of the 1994 winter olympics and the town breathes winter sports. The olympic skiing and biathlon stadium is in the hills outside of town, ski jumps over look the valley and there are facilities for Hockey. Of course, ski trails connect everything. Wednesday we went for a great 35km ski to check out the Birkie trail and to explore Sjusjøen, one of the last towns you ski through during the race. 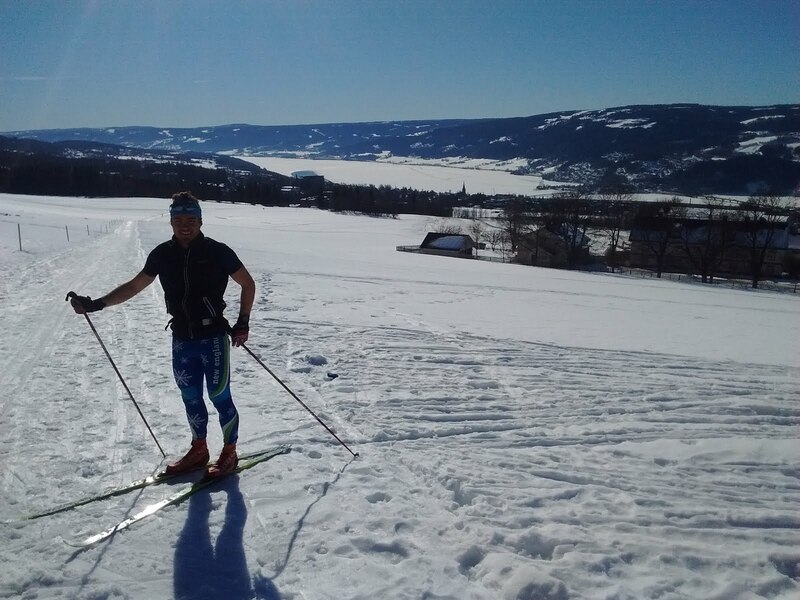 Sjusjøen is known for it’s amazing ski trails and it is the epicenter of more than 2500km of trails. The temps were warm and it was nice to ski in t-shirts. The klister skiing was great and the views were even better! 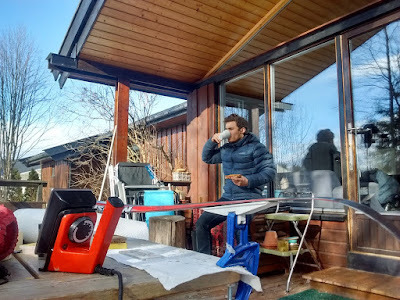 Thursday we went on another nice ski, explored town and picked up our bibs from Haakon Haakosson hall before heading to Elverum (closer to the start of the race, Rena) to meet and stay with Hallvard and Unn, friends of friends of Tyler. Years ago, Tyler’s dad and his friend John stayed with them when they raced the Birkebeiner. Hallvard put immediate pressure on us to best their times. Brown cheese, coffee and waxing. What could be better? Our pre-race workout was exploring Elvrum and drinking coffee and we felt fairly refreshed when we woke at 5:00AM to travel to Rena, where the Birkebeiner began. 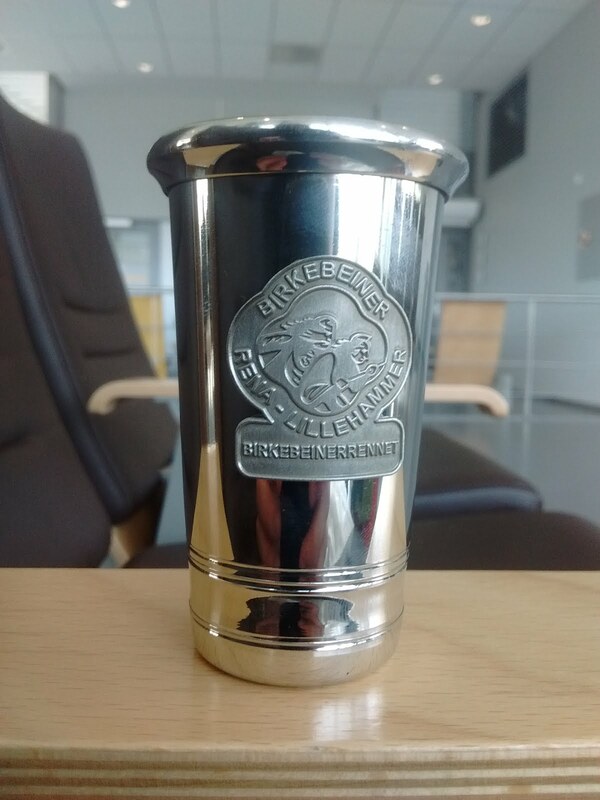 The Birkebeiner, like the Vasaloppet, is rooted in history. In the late 1100s and early 1200s, factions in Norway battled each other for political control. One of these, the Birkebeiners (which means “birch leg”), was so poor that they used birch bark to protect their legs and feet instead of socks and shoes. The strife endangered baby prince Haakon Haakonsson and to protect him, Birkebeiner soldiers skied him to safety 1206, purportedly resting in Lillehammer, where the race ends, over Christmas. Today, all skiers, from the winners to today’s crown prince, Haakon Magnus (who has skied the Birkebeiner the last two years), wear backpacks weighing 3.5 kilograms to symbolize the burden of the baby. 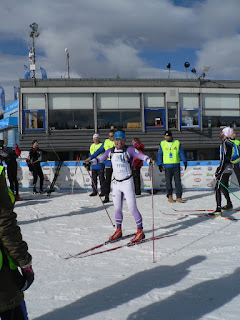 The race travels over exposed mountains from Rena to Lillehammer, which was, or at least represents, the route the Birkebeiners skied. In the end, baby prince Haakon grew up to be the king that restored stability to Norway. I’m afraid our backpacks have no such potential. The race is hard. It starts at its lowest point and climbs almost 600 meters over the first 20 kilometers before dropping 200. 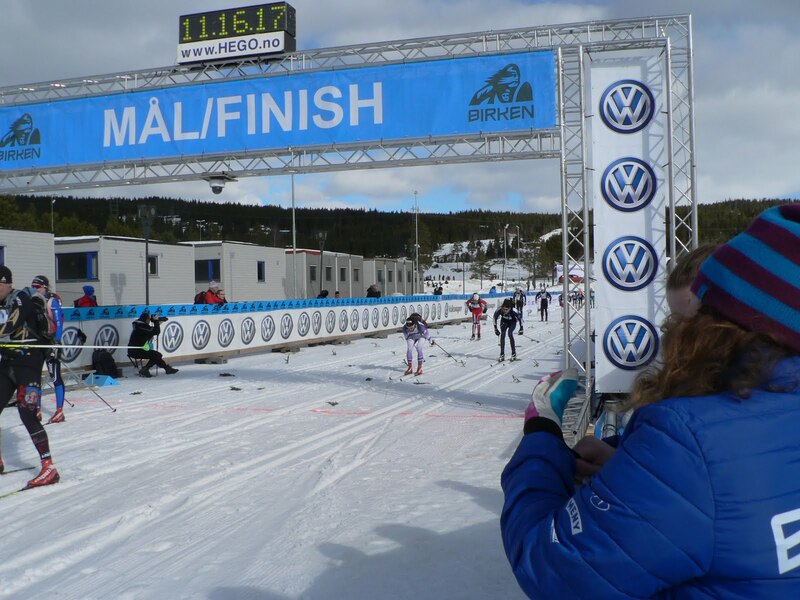 Another 250 meter climb follows starting at about 27 kilometers and it isn’t until 40 kilometers into the race that the long descent towards the Lillehammer stadium begins. While last year’s race winner double poled, we decided that would be a foolish choice for us. We used a Rex skare blue klister binder with violet klister on top for kick and, in the cold-ish, sugary tracks, our waxed worked well. 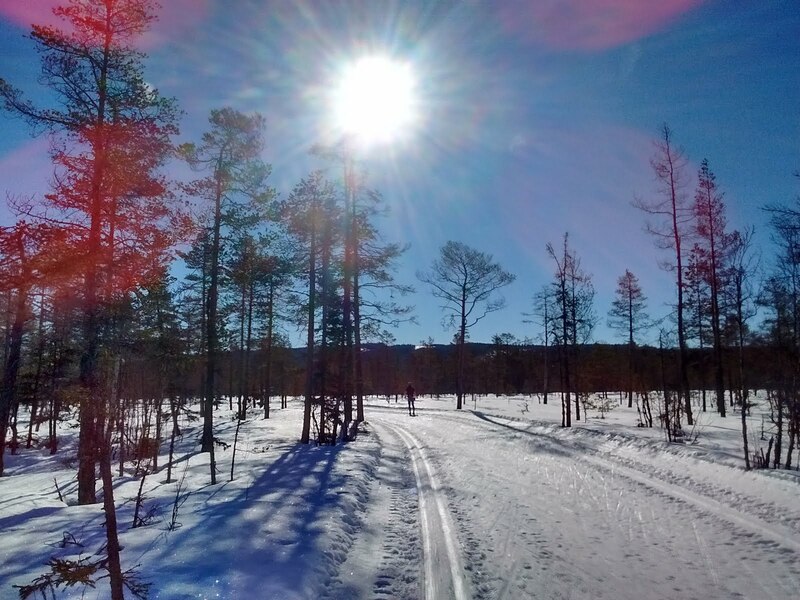 Although there are over 10,000 skiers who ski the Birkebeiner, the race starts groups of about 300 individually so that the trails are not too congested. We started in wave 2, five minutes behind the elite skiers. Despite the difficulty of the course and the cumulative effect of the last nine marathons on our bodies, we both skied smart, well-paced races, starting slowly and then moving up through our group. 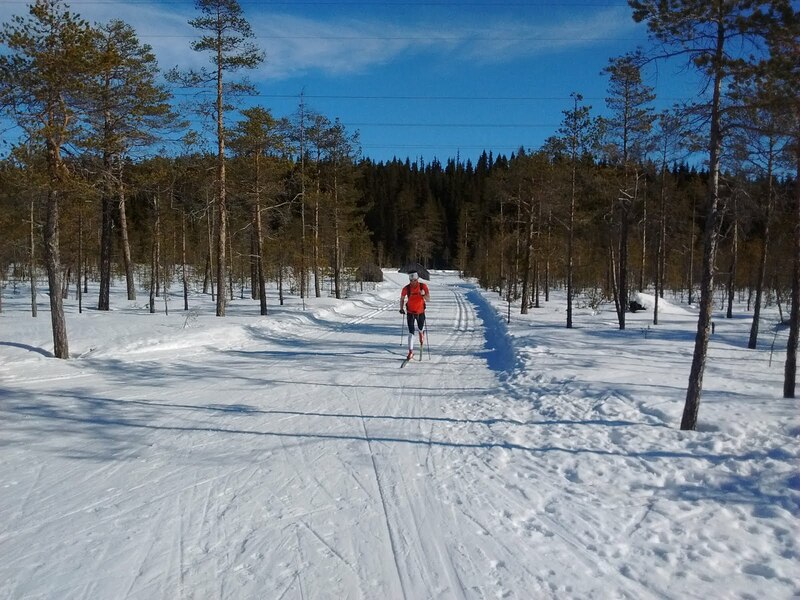 The later hills in the race were certainly a grind, but neither of us hit walls like we did in the Vasaloppet (we attribute part of this success to the coke and coffee feeds the race gave out with 12 kilometers to go). Tyler had the race of the day, finishing in 3:05:03 for 287th place. Jackson finished in 3:10:27 for 405th. Both of us earned our “merket,” or mark (25% time back from our age group winner), which is so prestigious in Norway that many business executives put it on their CVs. The historic, beautiful race was the perfect cap to our racing experience in Europe. With our bodies beginning to grow weary from the travel and toil, we now head home to Maine. We feel lucky that our trip went so smoothly and are exceptionally grateful to all those who helped us and hosted us along the way. Everyone’s generosity was staggering. The Vasaloppet registration for 2017 already filled up this morning, but with some race cancellations and holes in our schedule, we still have to race 10 more Worldloppets to check them all off of our list. So we suspect we’ll be back. It is definitely bittersweet to see the end of the trip but we are both excited to move on to the next adventures. Tyler has picked up a job teaching at Maranacook through the end of the school year and Jackson is going to spend some time painting commissions before deciding what's next.